The campaign of Rhode Island Senator Sheldon "Chardonnay" Whitehouse is suddenly in panic mode after what has been viewed as a disastrous three weeks. Whitehouse is still reeling from becoming a national punchline after his questioning of Brett Kavanaugh during the Senate Judiciary hearings. Whitehouse has been mocked on Saturday Night Live and now South Park. 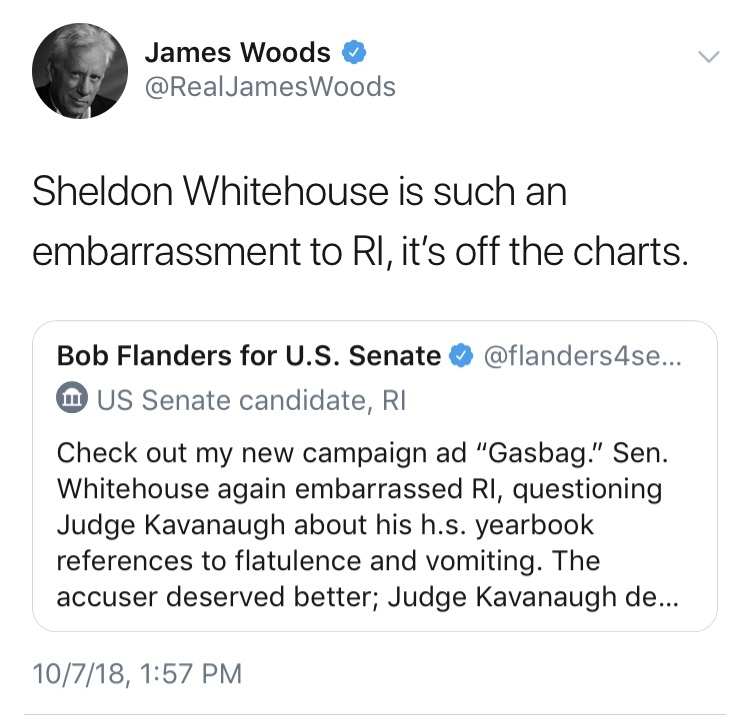 Around the country and around Rhode Island, Sheldon as become an embarrassment asking Kavanaugh about yearbooks and farting. Momentum has shifted as Republican Bob Flanders has been gaining traction and receiving donations from around the country as Sheldon as now seen on shaky ground. Whitehouse has watched his lead in the campaign plummet with Independent voters and especially among male voters. Flanders has seen tremendous growth across the spectrum but has rocketed among Independent male voters. Will Sheldon apologize to Judge Kavanaugh and his family for the filthy smear campaign they unleashed on him? Will Sheldon reveal who was the reporter he was trying to leak fake accusations too?